Sage provides an enterprise-level business management solution for manufacturing operations that assists customers with the entire process: from financial management to supply chain management and production management. 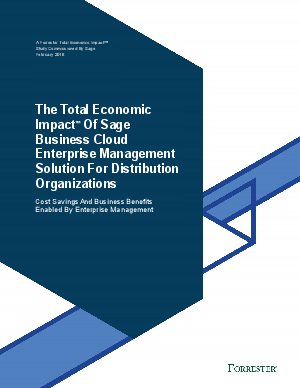 Sage commissioned Forrester Consulting to conduct a Total Economic Impact™ (TEI) study and objectivelyexamine the potential return on investment (ROI) enterprises may realize by deploying its Enterprise Management solution as part of Sage Business Cloud. The purpose of this study is to provide readers and prospects with a framework to evaluate the potential financial impact of the Enterprise Management solutions on their manufacturing organizations. To better understand the benefits, costs, and risks associated with this investment, Forrester conducted in-depth interviews with four Enterprise Management manufacturing customers, each with at least three years of experience using Enterprise Management. For this TEI study, Forrester has created a composite Organization to illustrate the quantifiable benefits and costs of investing in Enterprise Management for Manufacturing. Based on characteristics of the interviewed customers, the Organization is a global, midsize enterprise in the discrete and process manufacturing industry. It has major operations in North America, Europe, and Africa, with minor multisite operations globally. It has been using Enterprise Management for three years to enable its business process activities. For more information, see the section titled: The Composite Organization.